This is the story of two recipes that didn’t turn out at all the way I planned. I was going to make you pink strawberry waffles today. My baby–my first baby–turned six and, not to be outdone by her sister’s chocolate waffle birthday coup, requested strawberry waffles for breakfast. Pink, please. They were delicious. I used my regular yeast-raised batter (which works beautifully for both waffles and pancakes), adding a few generous spoonfuls of strawberry preserves in place of the sugar. And then, in a stroke of genius suggested by a reader-friend, I tinted the batter as pink as can be with a sprinkle of that beet powder I thought I’d never use again. Of course, the baked waffles were mostly waffle-colored, which was a bit of a disappointment to us all (mostly me). They sure were tasty, though. Next time I’m trying Kim Boyce’s beet pancake recipe from Good to the Grain, in hopes of producing something that looks more like this, which would impress the pants off of most of the six-year-olds I know. So that didn’t go quite as planned. I offer you another sublime pink concoction instead. Let me now admit that this is the second time I have tried and failed to make the Sweet Cherry Butter recipe (it’s a cooked-down fruit butter; think apple butter–but, you know, with cherries) from Food in Jars. The first time I got lazy, couldn’t face the long cooking time, and made cherry jam instead. This time I went through with the hour of cooking and frequent stirring only to chicken out at the last minute; the candied cherries were so good that I couldn’t bring myself to puree more than a little bowl of them into cherry butter. I give you the happy result. Allow me to suggest that you serve a spoonful of this thick, jammy spread atop a rosemary La Panzanella cracker smeared with a soft, salty blue cheese. 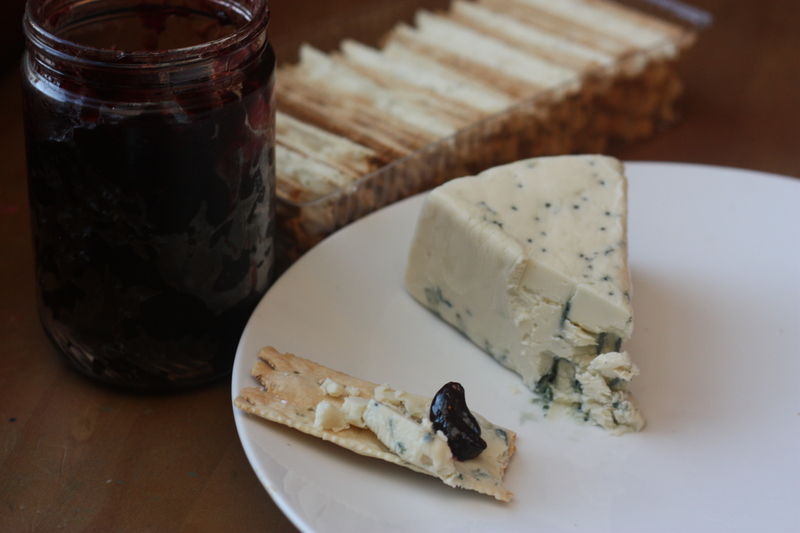 Blue Cheese and Crackers with Candied Cherry Preserves: Wash and pit 2 lbs. cherries (about 4 c.) and put them in a heavy-bottomed pot with 1 c. sugar. Bring to a simmer then reduce the heat to low and allow it to simmer for about an hour, stirring frequently (and even more frequently as the mixture becomes thicker). Make sure to scrape the bottom of the pot well each time you stir so that nothing sticks and burns. When the cherries are cooked into a thick sauce, add the juice of half a lemon and taste, adding more sugar or lemon to taste. You can puree the mixture into a cherry butter at this point, or leave the preserves chunky as I did. Scrape into a jar and store in the fridge for up to two weeks. Serve on crackers with blue cheese or chevre, or anywhere else a dramatic preserve would be welcome. 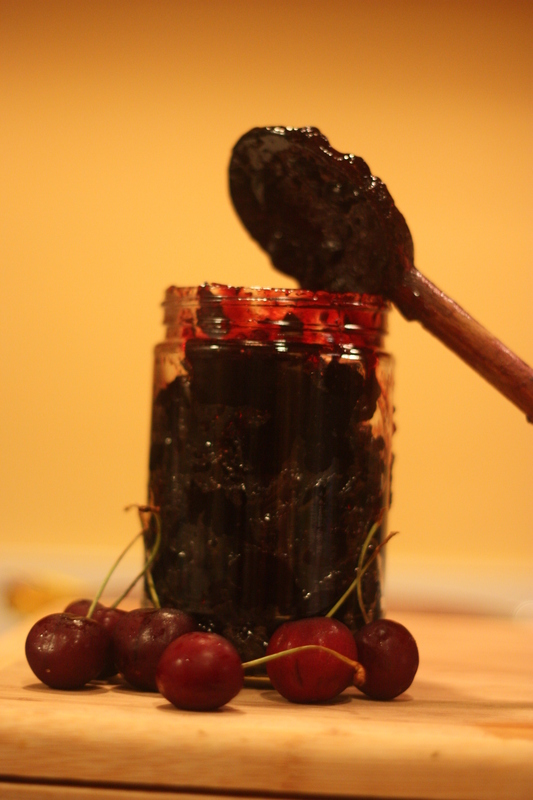 This entry was posted in Breakfast, Desserts, DIY, Fruit, Recipes, Vegan or Would-Be-Just-As-Good-Vegan and tagged cherry preserves, DIY, food in jars, fruit butter, jam, pink waffles, preserving, summer CSA recipes, summer fruit on August 17, 2012 by emmycooks. I admire posts that admit failure. This looks like a pretty satisfying fail all the same. MMM! I love this sort of thing! Great idea for our cherry surplus. Will be having with cheese tonight. I’ll be interested to hear your report on the “Good to the Grain” beet pancakes, as my family has placed them on the (thankfully short) list of unmitigated kitchen disasters. I might have been able to accept them as an interesting variation on the theme that doesn’t necessarily need to be repeated; the other three reacted in horror, and the kids were suspicious of anything not resembling a white-flour buttermilk pancake for months afterwards. This looks like an amazing taste combination! My fav spread for crackers is a schmear of black olive paste with a chunk of slow-roasted garlic on top. This one is fabulous, and a great way to use those cherries that are getting wrinkly and might soon move to mushy and moldy. Pink waffles! And ha, I love that you were inspired by us over here — that is why comments are good, they keep us connected to what is in our pantries ;) Blue cheese and cherries is some kind of genius … yum.